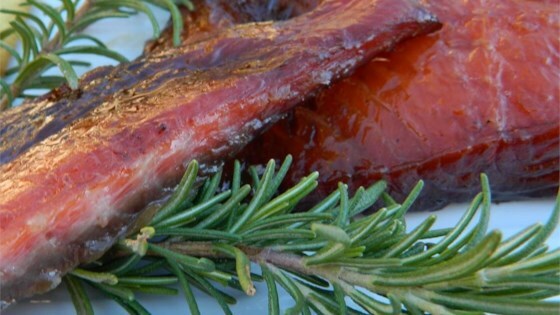 "Steelhead trout, also know as freshwater salmon, smoked to perfection with garlic and rosemary flavors. After the overnight marinade and the brine soak, it is all just watching as it smokes." Rinse the fish fillets and place them in a shallow glass baking dish. Drizzle olive oil over the fish and season with garlic and rosemary. Rub the seasonings into the fish. Cover and refrigerate overnight. Dissolve the curing salt in the water and pour into the dish with the fish. Let it marinate for 15 minutes per half inch of thickness. Meanwhile, prepare your smoker for a four hour slow burn using charcoal. The temperature should be at 150 degrees F (65 degrees C) before you get started. Remove the fish from the brine and discard leftover liquid. Place each piece of fish onto a small piece of aluminum foil - just big enough to hold the fillet, and season with pepper to taste. Place them on the rack in the smoker. Sprinkle a handful of the soaked wood chips over the coals or place in a heat box. Cover and allow fish to smoke for 2 hours, adding more wood chips as needed. Increase the heat in the smoker (add more charcoal) to 200 degrees F (95 degrees C) and let the fish smoke until the internal temperature of the fillets reaches 165 degrees F (72 degrees C). Remove from the smoker and let rest for 20 minutes before serving. Fantastic brunch recipe with smoked salmon. The nutrition data for this recipe includes the full amount of the brine ingredients. The actual amount of the brine consumed will vary. smoking times seemed a bit excessive so I used my common sence and cut it back to about 4 hours like it said in the recipe... turned out real good! Try using pecan hulls in your smoker. I just did a few rainbow trout filets and smoked them using ONLY pecan hulls. They are fantastic and you really get the pecan flavor. Thanks Shadows1, I've made this quite a few times and getting ready to make again, very tasty!